The Peoples Democratic Party, PDP, said yesterday that it is not aware of the planned defection of one of its members in the Senate, Godswill Akpabio, a serving senator and former Governor of Akwa Ibom State to the ruling All Progressives Congress, APC, stressing that it is yet to be notified. The National Publicity Secretary of the PDP, Mr. Kola Ologbondiyan said these at a press conference in Abuja yesterday. 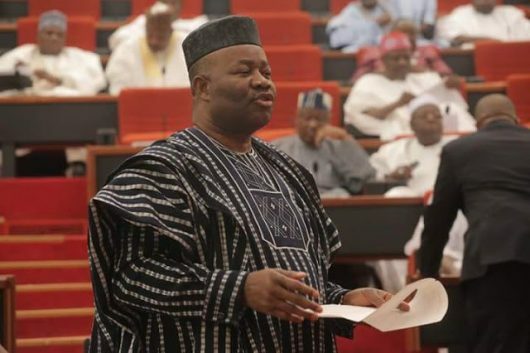 According to many media reports, Akpabio, who is the Minority Leader of the apex legislative chamber, is on the verge of defecting to the APC, having visited the acting President, Prof Yemi Osinbajo, the leader of the party, Asiwaju Bola Tinubu as well as the President Muhammadu Buhari in London on Sunday. The Senior Special Assistant, SSA, to the President on National Assembly Matters (Senate), Senator Ita Enang equally confirmed a reception will be held this week in Akwa Ibom to formally receive Akpabio into the APC fold. But Ologbondiyan insisted, while reacting to the issue of the trending story that the Senate Minority Leader and former Governor of Akwa-Ibom was set to defect to the All Progressives Congress(APC), that the PDP was yet to be notified. Howeve, Senior Special Assistant to the President on National Assembly matters (Senate) Senator Ita Enang Enang revealed that the Senate Minority Leader, Godswill Akpabio, (PDP) would officially be received into the ruling All Progressives Congress (APC) in Uyo, the Akwa Ibom state capital, tomorrow. He added that several other Senators from the main opposition and other minority parties would also join the ruling party soon.